At Beyond Philosophy, we recognize that many organizations are facing the important task of designing a customer experience program from the ground up, possibly even for the first time. We have the experience to help guide you through the process, answering all the pertinent questions along the way. Assess the current experience looking for the opportunities for improvement: in this step we look at the internal capabilities and the external experience that is delivered to customers. What are the current problems with the experience? Where are the opportunities to improve? What would drive the most value ($$$) to the organization? DEFINE WHAT YOU WANT YOUR CUSTOMERS TO ASSOCIATE WITH YOUR EXPERIENCE: NEXT, HELP OUR CLIENTS DEFINE THE CUSTOMER EXPERIENCE THEY WANT TO DELIVER. What are the key elements you want to stand for? What words or phrase do you want to choose to represent your experience? Identify the key influencers inside the organization (and who influences them). DESIGN: THIS IS WHERE THE CONCEPT TAKE THE FORM OF A BLUEPRINT WITH SPECIFIC AND MEASURABLE GOALS. How will the intended customer experience translate into each department’s activities, behaviors and measures? How will the re-designed experience look and feel like for the various personas? What’s the expected ROI of this change? IMPLEMENT THE PROGRAM THROUGHOUT THE ORGANIZATION. HERE IS WHERE YOUR STRATEGY AND ACTION PLAN GET TO WORK. How to evangelize the Customer Experience inside the organization and keep the momentum? How will we measure our progress (i.e. what will be our Customer Experience Metric)? What rewards will be associated with each department’s success? REASSESS AND MONITOR IS WHERE YOU HAVE DONE THE WORK TO DESIGN, BUT NOW YOU LOOK AT WHAT IS WORKING AND WHAT ISN’T. YOU MAY NEED TO CHANGE HOW SOME PARTS OF YOUR PLAN WORK IN ORDER TO GET THE RESULTS YOU NEED. What is or isn’t working well to get the results we need? How can we adjust our actions to get a better outcome? There is a big difference between a process and an experience. Most organizations are used to looking at what the process should look like form in internal perspective (inside-out) and not see things from customer’s perspective (outside-in). All effective customer experience programs design with the idea that your customers are human and as such will not always act in the most rational way (as as you want them to). This means that the designs must take into account the humans that are using them. 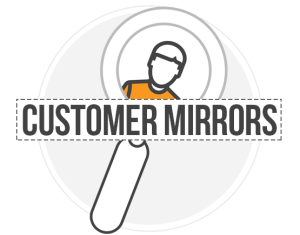 Our Customer Mirrors assessment approach help you see what the experience is like as a customer so that you can see better what makes enjoyable experiences. From identifying root causes of a poor customer experiences to the why, how and how much it will take to fix them, Customer Mirrors allows you to see all the ways you can make a human-centered design that improves your overall experience with your customers.